I woke up on Friday morning (early Friday morning, thanks to the construction on the house next door!) 35 years old. It was an exciting birthday, as I meant I was in a new age group for most races! Ha ha. The sun was up and I wanted to head out for a run before we took on the rest of our busy day. I had my Garmin to track my miles, but I wasn't sure exactly what route I would take. I decided to start running on the path around Mission Bay and thought I might just run a little bit one way on the path and then turn around and come back. I ended up feeling a little adventurous and instead of turning around between 1.5 and 2 miles out, I just kept going. It turned out to be a perfect five mile run, around a big part of Mission Bay and over three bridges! I was HOT when I finished, but it was an exhilarating way to start things off as a 35 year old! The route my Garmin read. When I got back to the beach house Matt and the girls had wonderful cards waiting for me. Iris tried her hand at cursive writing and Eloise sounded out all of the words on hers. So fun! After eating and showering we were off . . . to the San Diego Zoo! I almost had a heart attack when I looked up the cost of tickets online, but was happy to learn that during October kids got in free! So we "only" paid just over $100 for our passes. When we got inside we headed straight for the tour bus line and waited. And waited. It was worth it, though. We got a tour all over the zoo from the top of a double-decker bus and got to see a lot of animals. After the bus tour it was time to do some serious walking. At the end of the day we covered about four miles! All that walking and we still didn't even see everything. My favorite was definitely the panda, though we were bummed the baby panda wasn't out for public viewing. If you want to see the baby panda, you can check out the Panda Cam! This guy didn't look happy. Probably because one of his humps was lop-sided. Cutie red panda sleeping in a tree! Gorilla eating a head of iceberg lettuce. 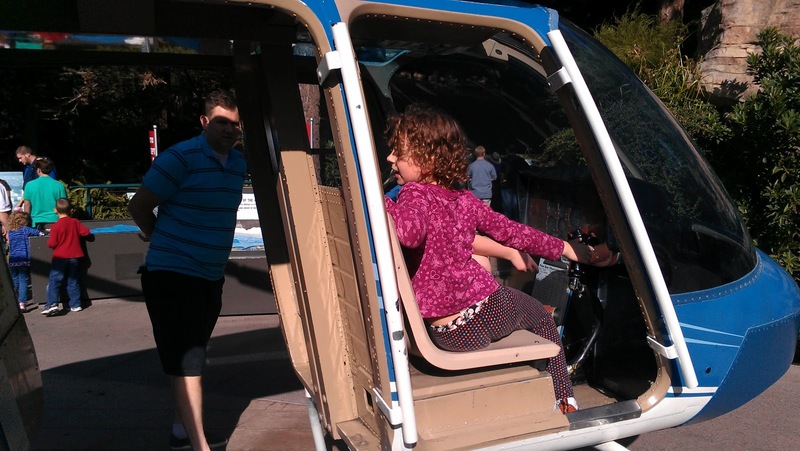 Eloise begged to ride on the sky trams. Matt was not a fan. Matt's smile is fake. Eloise's isn't. We were both kind of indifferent. The zoo closed at 5:00, so we headed out right before closing time. Then it was off to Old Town! My massage therapist is from San Diego and she directed us to go to Old Town for a Mexican feast. The restaurant we randomly chose, Miguels, was awesome. 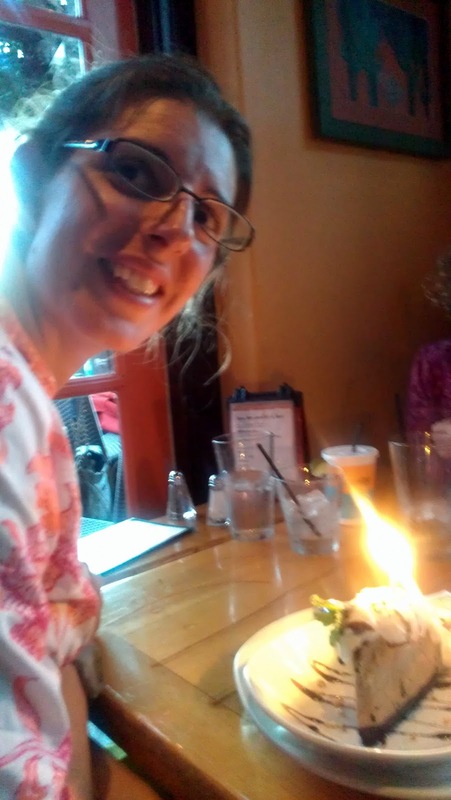 The food was so, so yummy and to top it off, when Matt told the waiter it was my birthday, he brought me a slice of mud pie! And they didn't even sing to me. Phew. The family practically had to roll me back to the car and we still took a bunch of leftovers home. I got about three bites of this thing, my children are vultures. After we got back to the beach house my saintly husband went out to get Ben and Jerry's for everyone and find a parking spot for our car, which is no easy feat on Mission Beach. We ended the night with ice cream and some random re-runs on Nickelodeon. Not too shabby! If this was a preview of my year to come, I think I'm going to like 35!